Hey Everyone! We're doing a "Turds For Gold" Shoe Exchange and, starting RIGHT NOW, we're sending a FREE PAIR OF CHROME SHOES to anyone that sends us a crappy, worn-out pair of kicks. The exchange is two days ONLY and packages MUST be postmarked by 3/18 to qualifiy. In your shipment, please include a return shipping address and shoe size info. Of course, since it was the last day of the promotion, I had to scramble to dig up my lucky pair of "Chucks" from the closet, toss them in a box and ship them out to San Francisco (thanks goes to my wife for making the trip to the post office). While I was waiting for my new kicks to arrive, I read all sorts of news about the promotion. Apparently, they took in over 5,000 pairs of used shoes and shipped out as many new ones. The cool thing is that they didn't just toss out the old shoes. 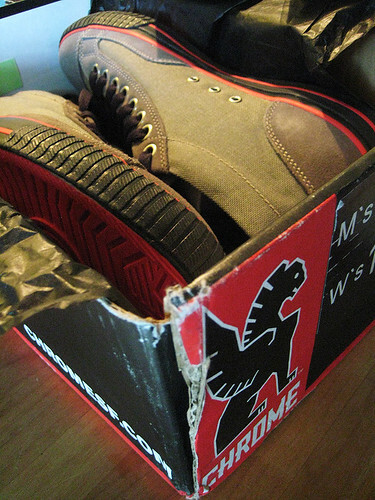 Instead, they donated them to those in need on the streets of San Francisco as well as to Haiti through Soles4Souls. Today, I got a great surprise. 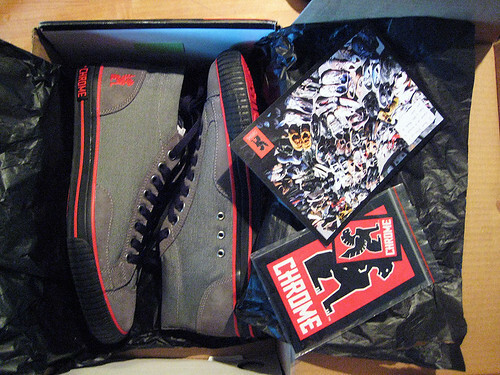 My brand new pair of Chrome shoes (Midway Cordura Grey) arrive in the mail. I have to say, free or not, these shoes are AWESOME! The style is cool, but not trendy with a hint of ol' school wrapped up in a hip, urban design. They've really captured today's cycling culture with these slick skids and I'm glad that I have a pair. They're also very comfortable. 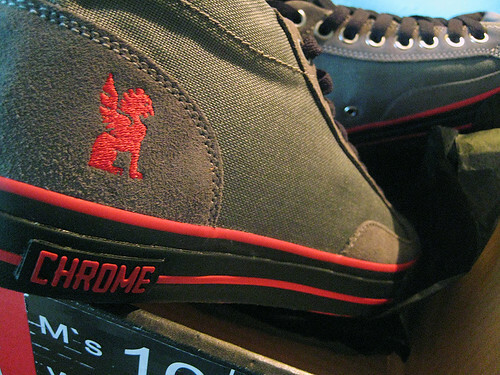 To me, these have a design similar to ol'school Converse Chuck Taylors - but much cooler. Because of that, I assumed they would have the same, notorious low comfort level as the "Chucks". Was I ever wrong. Of course, these would never replace a good pair of fitted cross-trainers, but I could see myself sporting these all day or even on a nice spin around town. I'm glad I stumbled upon this promotion. Thanks Chrome.